If you’ve been following this blog for a while, you’ll know that Rob is amazing. The reason he’s amazing? Because for the last 4 years, he let me drag him all over the UK to visit Harry Potter film locations. Yes, I am a fan of the films, but I’m also a fan of all the amazing locations that the various Harry Potter directors used in these films. 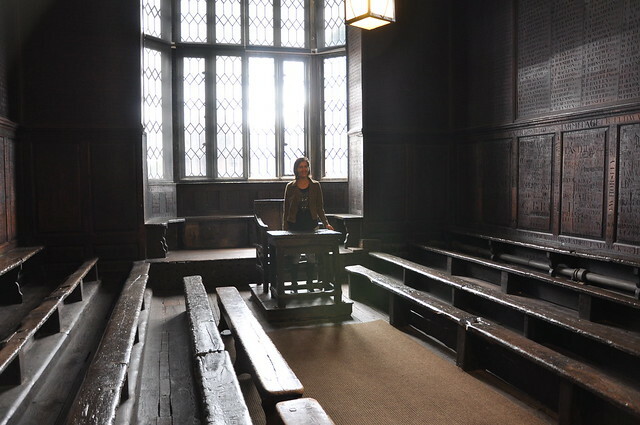 And I had one more to see last year – Harrow School’s Fourth Form Room which was used as Professor Flitwick’s Charms classroom in Harry Potter and the Philosopher’s Stone. The Fourth Form Room is in the lower left half of this building and I had only an inkling of what to expect. 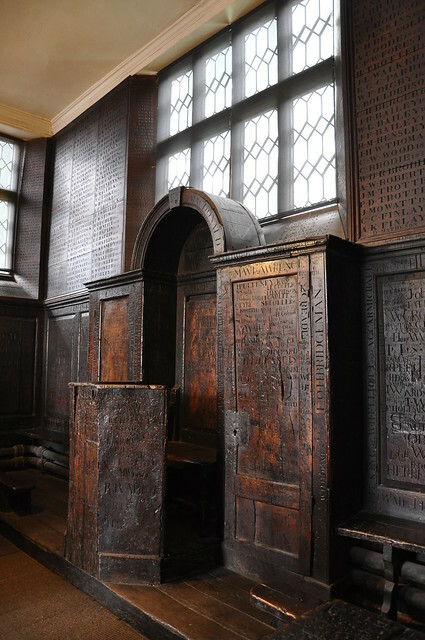 But this oak panelled classroom from the 17th century is stunning. 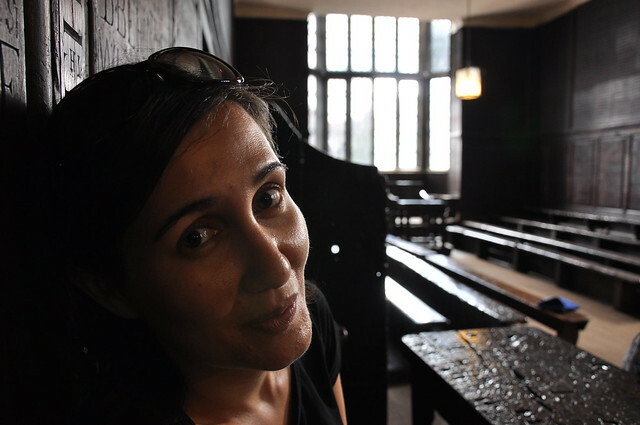 This room wasn’t Harrow’s oldest classroom – there was a older school house which doesn’t exist anymore. And when the classroom was originally built, it didn’t have the oak wood panelling – they were added in the 19th century. 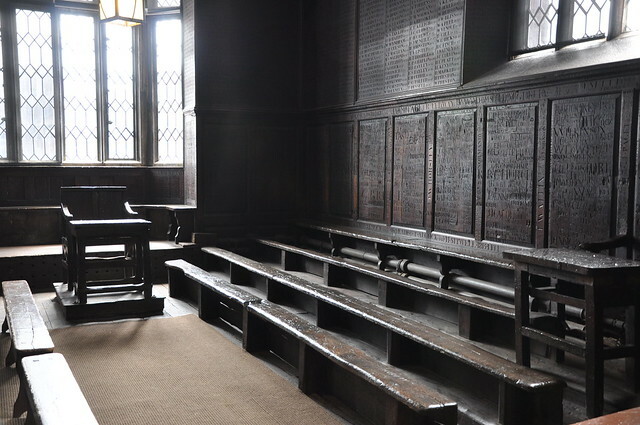 Before that, this room was used for up to 4 classes at one time, one in each corner of the room, and the headmaster sat in this alcove at the back of the room overseeing the classes. 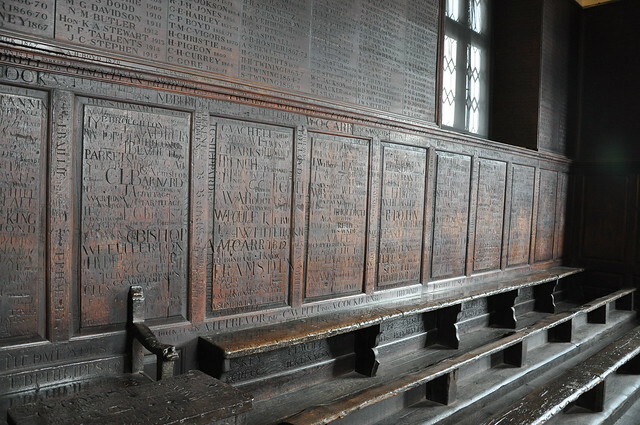 Once the oak panels were installed, students were allowed to scratch their names on the walls. 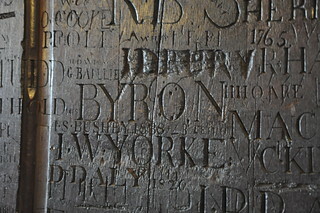 Some of the names are Sir Winston Churchill, Sir Robert Peel, Henry John Temple (Lord Palmerston), Richard Brinsley Sheridan, Lord Byron, Henry Cardinal Manning, John Galsworthy, Anthony Trollope and Lord Shaftesbury. 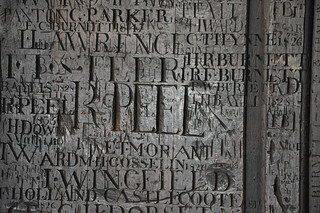 Modern day students aren’t allowed to engrave their names now the walls are full, but some of the school’s alumni are Beneditch Cumberbatch and James Blunt. What great history – what a room! But we were there for more than the history. We were there because it was used in Harry Potter. 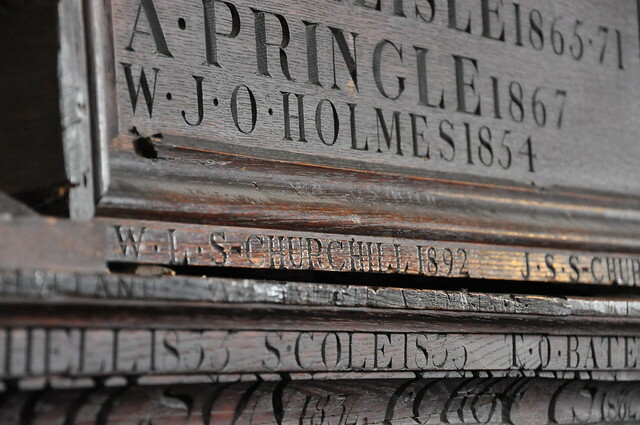 The film installed desks into the classroom – in the 17th century, the students wrote on wax tablets on their laps. 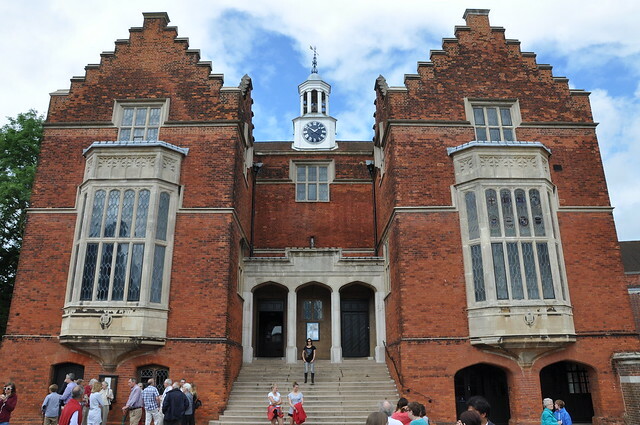 Harrow School is open for Public Tours 4 times a year and only costs £5 per person. It takes you through the Fourth Form room, the two on-site museums, the War Memorial and the Theatre and tells you all about the history of the school. A really interesting a couple of hours, and a very satisfying final Harry Potter sight. We’ve seen some amazing places in the UK because of Harry Potter. But that’s another blog post.